“Imperfect Shadow Maps for Efficient Computation of Indirect Illumination” by Ritschel et al., a real-time indirect lighting can be summarized as follows: it solves the visibility problem present in the paper “Splatting Indirect Illumination” by Dachsbacher and Stamminger. The splatting indirect illumination method works by rendering what the authors call a reflective shadow map. A RSM is a collection of images that capture information of surfaces visible from a light source. The RSM is then sampled to choose surfaces that will be used as Virtual Point Lights. Indirect lighting is then calculated as the sum of the direct lighting contribution of these VPLs. The idea of approximating radiosity with point lights was first described in the paper Instant Radiosity. In order to light the scene with each VPL, the method performs deferred shading by rendering some proxy geometry that bounds the influence of the light and effectively splats the illumination from that (indirect) light onto the scene. The problem with this method is that the illumination is splatted onto the scene without any information about the visibility of that VPL. The surface being splatted upon could be completely obscured by an occluder, but would receive the full amount of bounced lighting. 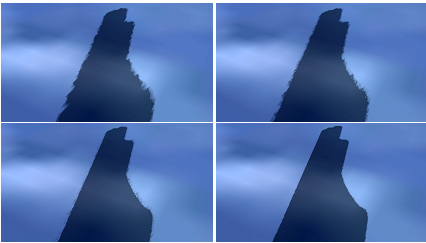 What you would really need here is a shadow map rendered for each VPL. But in order to get good indirect illumination you need hundreds or thousands of VPLs, which requires hundreds or thousands of shadow maps. Let’s face it, that ain’t happenin’ in real-time. First of all, you’d have to render your scene X number of times, which means you’d have to limit the complexity of your scene or use some kind of adaptive technique like progressive meshes. But on top of that you’d have X number of draw calls, which have their own amount of overhead. So what Imperfect Shadow Maps does is figure out a way to render hundreds or thousands of shadow maps in one draw call and with dramatically reduced amounts of geometry. The paper achieves this by rendering 1024 paraboloid shadow maps of a sparse point representation of the scene. During preprocessing, many points are distributed uniformly across the scene. Then, n sets of ~8k points are constructed, where n is the number of VPLs the algorithm will use at run-time. The number 8k is not mentioned in the paper but the author stated this number in his SIGGRAPH Asia presentation. The points in these sets are chosen randomly. At run-time, each of the n sets of points are rendered to its respective paraboloid depth map. It’s a Cornell box, can’t you tell? But it doesn’t matter so much because the indirect illumination is smooth and you’re going to adding the contribution of hundreds of these things at each pixel, so the incorrect visibility of each individual VPL gets smoothed out in the end. The authors present some other cool things in the paper, like how to adaptively choose VPLs from the RSMs, and they also use the trick from “Non-interleaved Deferred Shading of Interleaved Sample Patterns” (talked about here) and only process a subset of the VPLs at each pixel. Also, there is a paper that just got accepted to I3D called “Multiresolution Splatting for Indirect Illumination” by Nichols and Wyman that is a perfect fit for this paper. I’ll probably post a bit about that tomorrow. Tobias Ritschel, Thorsten Grosch, Min H. Kim, Hans-Peter Seidel, Carsten Dachsbacher, Jan Kautz ACM Trans. on Graphics (Proceedings SIGGRAPH Asia 2008), 27(5), 2008. Dachsbacher, C. and Stamminger, M. 2006. In Proceedings of the 2006 Symposium on interactive 3D Graphics and Games (Redwood City, California, March 14 – 17, 2006). I3D ’06. ACM, New York, NY, 93-100. Iñigo Quílez posted a recent presentation on the techniques used in the “Slisesix” rgba demo. 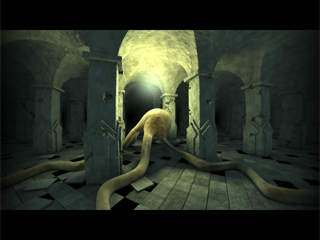 By procedurally generating a distance field representation of the scene, a fast, space-skipping raycast can be performed. 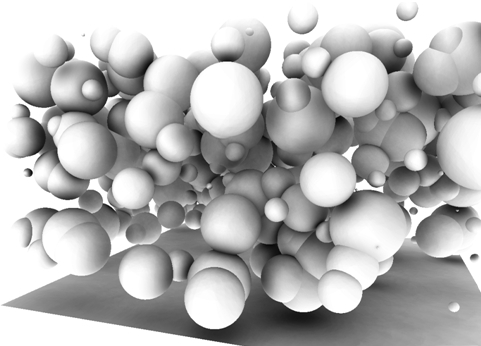 Using a distance field representation allows other tricks such as fast AO and soft shadow techniques because information such as the distance and direction of the closest occluders are implicit in the representation. Alex Evans talked about using this type of technique ( see Just Blur and Add Noise) but in his proposed implementation the distance field came from rasterizing geometry into slices and blurring outward. Humus recently posted a new demo. 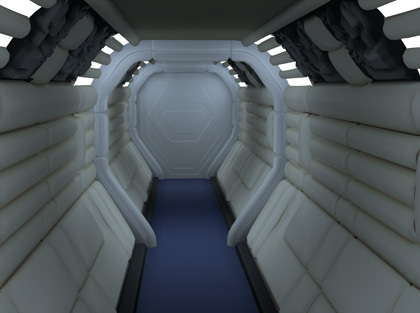 He renders the interior of rooms visible from the exterior using cube maps. This eliminates the need for additional geometry to represent the interior. With D3D10.1, cube map arrays are used. This allows different cube maps to be selected dynamically in the shader to add variety to the rooms rendered. It seems to me that you could additionally transform the vector used to fetch from the cubemaps to provide a random rotation around the vertical axis to provide further variation between rooms.